I have been working on this card off and on for a couple of days. I leave it alone and come up with another idea and incorporate it into the card .... does that ever happen to you? Sometimes it is best to leave a project alone until inspiration hits you and you add another element; and then, while adding that you come up with something else!! This is just what happened to this card. I had purchased some of these textured pocket pre-scored cards from SU and have finally gotten down to the last couple of card. 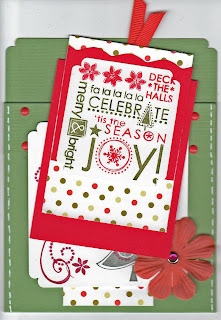 The stamp set I had packed away from last year's Christmas sets and thought it would be perfect for this. I only used the one set (from 8 stamps within the set). 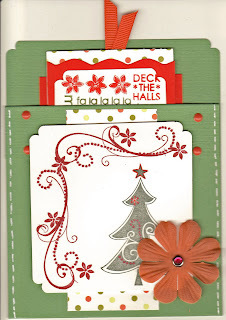 I added the flower accent last and it just was the right element needed to dress up this card. Thank you for stopping by and come back again soon. You have just outdone yourself this round Mom!!!! Organizing your space was a great idea!